Underdrains collect filtered water during the filter run, and distribute air and water during the backwash cycle. Providing cleaner filters mean longer filter runs and higher water efficiency, more product water, and less waste. This lowers operating costs per gallon or liter of filtered water. All Leopold underdrains deliver the superior performance that has made the Leopold underdrain the industry leader. The Leopold Type XA™ underdrain gives unprecedented flexibility and faster, affordable construction, all in a low profile underdrain. Longer laterals combined with all the standard flume layout options give more design flexibility than any other low profile underdrain. 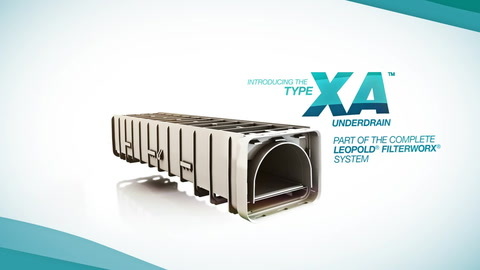 The Type XA underdrain maintains its superior air and water distribution with new, patented interior baffles and dual water recovery channels. It also delivers superior uplift resistance (or hold-down) performance without the need for expensive mechanical anchors. The key is Xylem's patent-pending grout pocket, which fills with grout during installation and assures the Type XA underdrain will not lift from the filter floor, even if internal operating pressures reach 30 pounds-per-square-inch (2 bar). The innovative dual parallel lateral design and the water recovery channels, both developed by Leopold, give even distribution with less than +/-5% maldistribution and no dead zones. The air flow adjustability allows for more control and saves energy and water. Air scour rate can be adjusted from 2 to 5 scfm/sq.ft. (0.6 to 1.5 m/min), enabling collapse pulse cleaning during concurrent air/water backwash with various media configurations. Air scour provides higher shear forces and cleaner media, with less wastewater generation. Specially engineered features enable simple construction or retrofits without compromising quality, reliability or performance. Snap-on/off handles allow two workers to easily maneuver blocks into position, and the blocks snap together with a bell and spigot seal, expediting installation. In addition, the Grout-Tite® Bridge prevents grout from entering the flume, so there's no costly cleanup. The Type XA underdrain can be specified with Leopold I.M.S.® 1000 or 200 media retainers and factory-installed on the Type XA underdrain to save time at installation. The I.M.S. media retainers replace up to 14 inches (36 cm) of gravel media support allowing for the same media depth in less vertical space and longer air/water backwash.